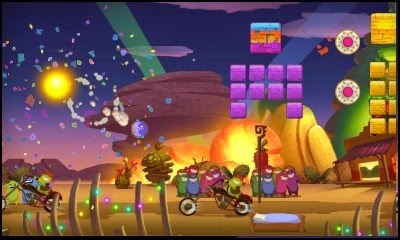 From Mojo Bones comes Siesta Fiesta, a Breakout-style game with a twist for the Nintendo 3DS eShop. Is the game fun like a fiesta or so boring that you'll want to take a siesta instead? We're Gonna Fiesta Like It's Cinco de Mayo! The concept of Breakout is nothing new. You move a paddle around, you break blocks for points, rinse, and repeat. There's so many Breakout clones and games inspired by it that one can easily grow fatigued of the formula or at the very least be weary of checking new games of the style out. However, Mojo Bones's Siesta Fiesta takes the Breakout concept and throws in some remarkable alterations to the structure that make it a worthy addition to anyone's 3DS digital library. 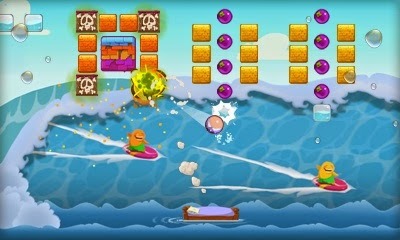 Siesta Fiesta tasks you with moving through eight unique worlds of a half-dozen or so levels apiece and has you moving a bed, Siesta Fiesta's equivalent to a paddle, to bounce ball and break blocks. The levels are mostly side-scrolling affairs that move a slow enough speed so you have a fair opportunity to break the majority of the blocks, and possibly even all of them if your trajectory is super sharp. When the ball hits the middle of the bed, it bounces straight up, while the sides of the bed make the ball move diagonally left and right respectively. was quite adorable to me. 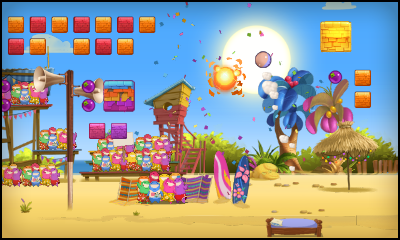 Siesta Fiesta is a game of skill and keeping your Siesta character (i.e. the ball) from falling to the ground. Each time you let it hit the ground, one of your "lives" is removed. You get five different Siesta to use, if need be. It would have been nice to have gotten a point bonus for using the same Siesta from the beginning of a level to its end, because as it stands now, getting gold medals and even sometimes silver medals through reaching a high score can be maddeningly challenging! That said, the levels are so short, taking about two or three minutes to complete, that there's encouragement to keep playing and try again. Replaying past levels is as simple as choosing them from a list on the bottom screen when in that area's map. so it's best to save battery life and play in 2D. Typical levels introduce new gameplay mechanics at a fairly brisk pace. 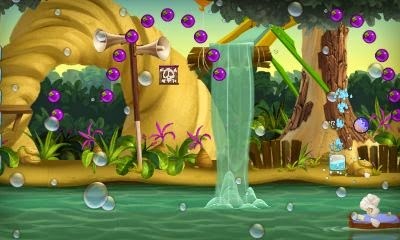 This adds great variety in obstacles and objects to look out for. There's your standard small blocks that break with one hit, larger blocks that take two hits but offer more points when broken, and gold blocks that can withstand three hits before breaking apart. Then there's cannons that shoot your Siesta across the screen, pinball-like bumpers, party gates that award points when your Siesta passes through all of them within a limited amount of time, and exploding crates that take away points for smashing into them. There's even more that I haven't listed, so you can be sure there's plenty of new challenges and objects you need to learn how to deal with. Other levels are not side-scrolling affairs at all. Time trial levels present multiple waves of boxes, whether moving or stationary, that require you to destroy all of them within a set amount of time. The faster you destroy all of the boxes, the better medal you are awarded. These levels are similar to the end-of-area boss encounters that have you smashing your Siesta into the boss's weak point in order to defeat them in a fast enough fashion. Variety is the spice of life, and Siesta Fiesta has got it in spades. Rollin' down the river, Siesta Fiesta style! Siesta Fiesta isn't a game for everyone. It can be unrelenting in its challenge, especially if you're unable to control the ball the way you might like. There's nothing worse than trying to direct your Siesta ball toward a gold block for big points only to have it bounce around on the top of the screen, costing you time and being able to hit the block, in addition to making you feel quite helpless in the process. That said, those who wish to share scores to Miiverse, set high scores, get all gold medals, and have a seriously good time will enjoy Siesta Fiesta with much amor.